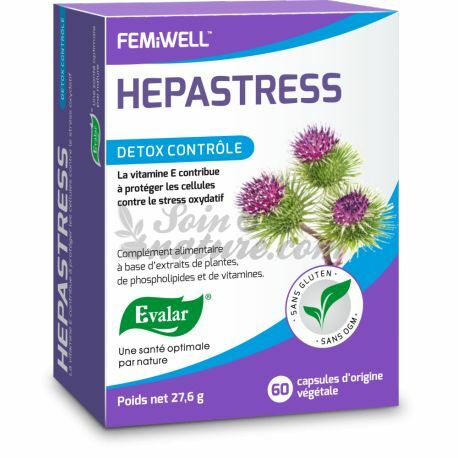 FEMiWELL Hepastress Detox Control 60 capsules in our pharmacy bio, Comment on advice for use and dosage with our partner Avis checked after your purchase. Pollution, tobacco, stress ... Our environment and our lifestyle impact our production of free radicals that can damage our cells. It is when free radicals are in excess that we talk about oxidative stress. The liver is the main organ in charge of detoxification, it plays a key role in the elimination of toxins and the management of these free radicals in the body. 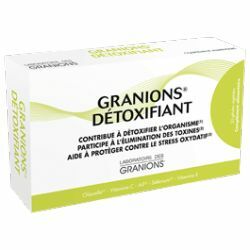 In which cases should Hepastress Detox supplements be taken ? 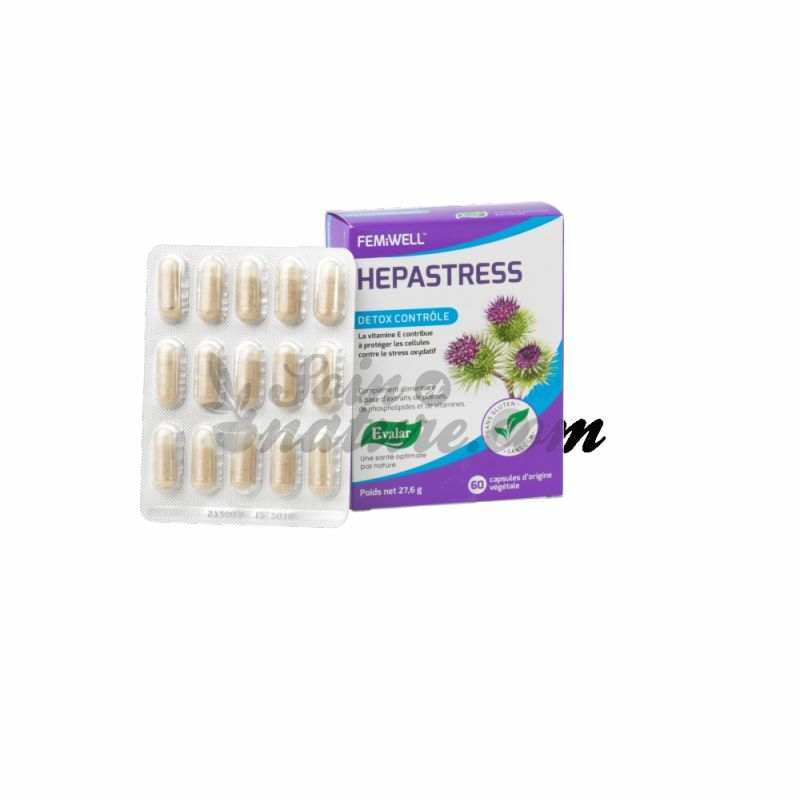 The Hepastress supplement helps protect your cells against oxidative stress, for a naturally purified organism. Vitamins B : play a vital role in cell metabolism. B vitamins are necessary for the proper maintenance of the skin and the immune system, the nervous system, and cell renewal , especially that of blood cells. 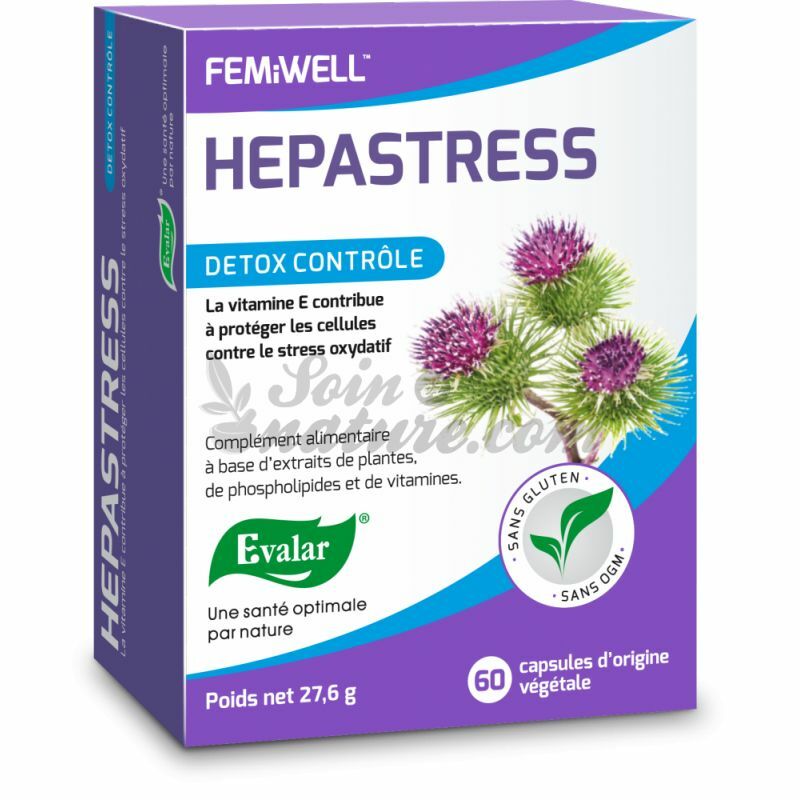 Comment on the advice of use and dosage of FEMiWELL Hepastress Detox Control 60 capsules with our partner Avis checked after your purchase. Hydroxypropylmethylcellulose (Envelope - E464), Milk Thistle Dry Extract (Sylibum marianum), Phospholipids, Green Tea Dry Extract (Camellia sinensis), Rice Starch (Anti-caking Agent), Burdock Dry Extract (Arctium lappa), Silicon Dioxide (Anti -cuffer - E470b), Vitamin E, Vitamin B6 (Pyridoxine HCI), Vitamin B2 (Riboflavin), Vitamin B1 (Thiamine HCI). In addition to HEPASTRESS, adopt a balanced diet and regular physical activity. Not suitable for pregnant or lactating women as well as children and adolescents. What is the best time to do a detox? The seasons are very important in the decision to make a detox cure, the body has a lot of change to handle between seasons. The cold of winter or the heat of summer, all our metabolism must adapt so there are certain periods that are more conducive than others, to embark on this process. The change of season is therefore the best time to perform a detox cure to prepare our body for change of temperature and change of pace. Leader in the Russian market, Evalar is one of the largest manufacturers of natural herbal medicines and supplements in the world. Evalar dietary supplements are made from plants from the Altai Mountains, a natural area free from pollution. They are guaranteed pure and GMO free. With its FEMiWELL range, the Evalar laboratory develops natural solutions, optimally dosed, to meet the specific nutritional needs of women . The laboratory controls and controls all of its manufacturing steps from "plant cultivation to the marketing of food supplements" and guarantees the quality and effectiveness of its products. FEMiWELL dietary supplements are specifically dedicated to women to improve their health . Find a selection of detoxifying food supplements in your bio pharmacy online. Effectively fight against the small inconveniences of everyday life with effective and quality remedies. 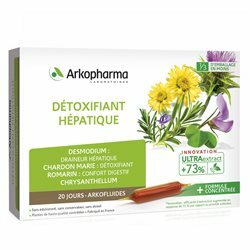 Our expert pharmacists have selected this new detox food supplement line and drainer accompanies you in eliminating waste from the body. Our detoxifying products are intended to enhance the body's action in eliminating toxins. The drainers will help eliminate them via their diuretic effect.